Happy Holidays from the Inkless Tales Podcast. Listen to a story about two children who are waiting for their first snowfall, as well as a Holiday song. Welcome back to the Inkless Tales Podcast for Kids. Foolishness is our topic today, and we have a story, a poem and a song for you to enjoy. 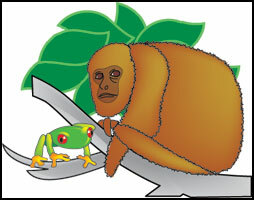 “Wet Roses,” “Meet My Dog,” and a story today that takes place in the rainforest about a foolish howler monkey and his wise friend, a red-eyed tree frog — a monkey who learns the value of friendship over foolishness. Enjoy the offerings today — and if you like what you hear, visit Inkless Tales at www.inklesstales.com for more fun, games, stories and play. This time around, we’ve got animal poems and songs, from Three Blind Mice to Dinosaurs Galore. And anytime you want to write, we’re here at elizabeth@inklesstales.com. And, of course, you can always visit us at Inkless Tales for stories, poems, games and more. Look for new stuff all the time. Welcome back to the Inkless Tales Podcast, written and read to you by Elizabeth Bushey. This time around, you’ll hear the poem: Chameleon, Come Talk to Me, and a story: Simple Jane. Want to tell me about it? Write me at elizabeth@inklesstales.com. For more fun stories, poems, music and more, visit www.inklesstales.com. Podcast #1: Beatrice Bee, Goldilocks, The Sleep Song. Welcome to the Inkless Tales Podcast for Kids. I’m Elizabeth Williams Bushey, the creator of Inkless Tales, and we’ve got stories to tell, songs to sing, and poems to play with. This time around, we’re going with a bee, some bears, and a bedtime song. Ready? Let’s go. Listen to the Inkless Podcast #1. It’s 15 minutes long.